"I have tried to make complex things with simplicity, and I will leave it up to you to judge if I have not succeeded. In any case, I have tried, intensely." Born at Varallo Pombia (Novara) to Giuseppe Favini, known as Bernardo, of Varallo Pombia, and Maria Meloni, from Pombia. The father is a real estate developer. The contracting firm FAVINI BERNARDO, specializing in reinforced concrete, would also be called S.A.R.C.A., Società Anonima Romana Cementi Armati. He is the second of three brothers. 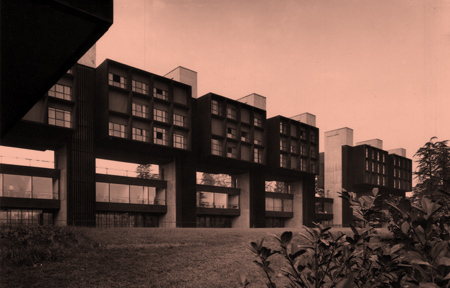 The eldest, Leonato, architect, born in 1914, who died in 1992, always operated in Rome. The youngest, Pietro Bernardo, born in 1927, is the owner of the contracting firm of the same name, still operating today. 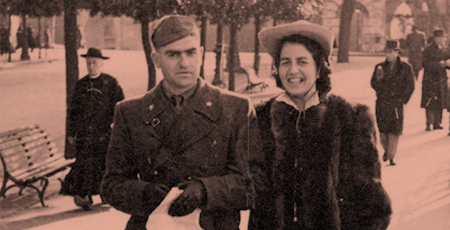 After the father’s military discharge, the family moves to Rome. Studies at the school for construction engineering in Rome, where he graduates and meets teachers who are decisive for his training, like Mario Ridolfi and Vittorio Serao. 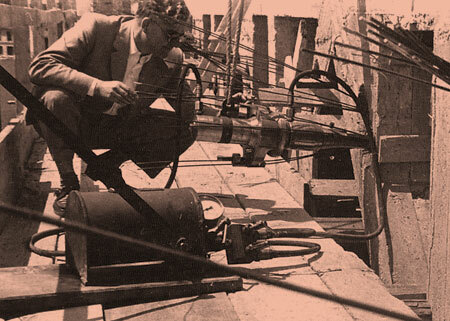 One month prior to graduation, he is called in by Ridolfi and Serao to work on the competition project for the bridge over the Tiber at Foro Mussolini. The task is to develop three bridge variations: “Maillart” type, “Risorgimento” or Hennebique type, and “Margherita” type: AF is assigned the verification of the “Risorgimento” solution. This is the start of his apprenticeship as an engineer-designer. He begins to work with the DOMENICO VITALI company in Rome, whose technical director is the engineer Vittorio Serao, the founder with Giuseppe Favini and other Roman businessmen of A.R.C.E., the Roman Association of Construction Contractors. 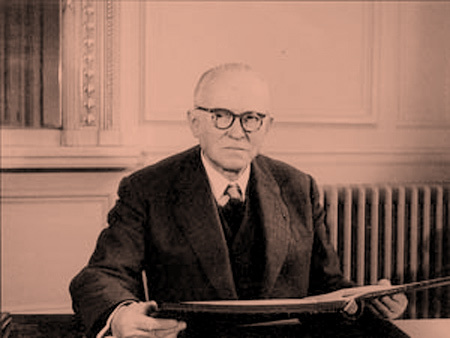 In the summer of 1935, thanks to an assignment with this company, he meets Prof. Giulio Krall. The company participates in competitions in this period with projects by Mario Ridolfi. Beginning of university studies, first in the Department of Economic Sciences and then, after his baccalaureate, at the School of Engineering in Rome. During graduate studies he meets Anna Gatta, a student of mathematics, who later becomes his wife. 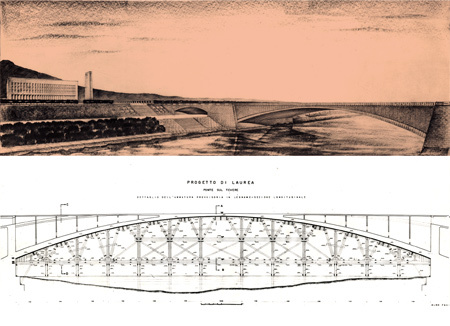 Degree in Civil-Construction Engineering from the University of Rome, with advisor Prof. Giorgio Giannelli; degree thesis: design of a “Risorgimento” type bridge over the Tiber. 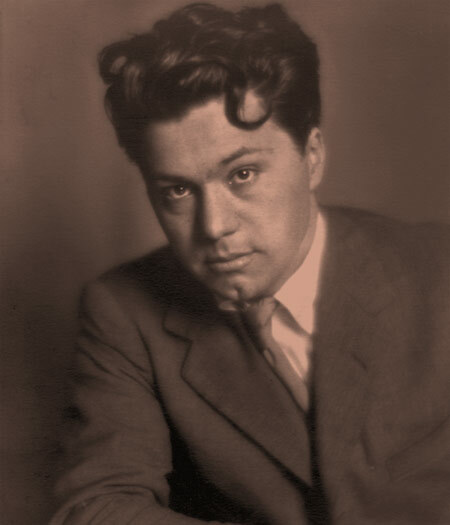 That same year, he passes the State examination at the University of Bologna. Call to arms. 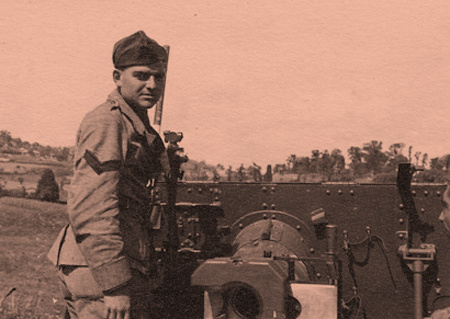 He serves as second lieutenant of Artillery at the anti-aircraft division of Ferno, near Vizzola Ticino (VA), until 8 September 1943. The division is headed by the Captain Eng. 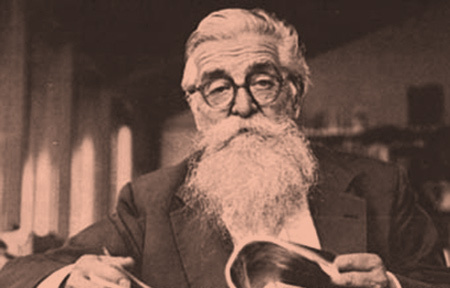 Mario Tamburini. Manages to cross the border, together with other Italian soldiers, and is confined in Switzerland. In Switzerland, at Mürren, he gives the first lectures on the science of construction for internee university students, and meets Gustavo Colonnetti who invites him to the Italian University at the Lausanne Polytechnic. He teaches Science of Construction in Lausanne for three semesters, also as assistant to the professors Panchoud, Bolle, Paris. 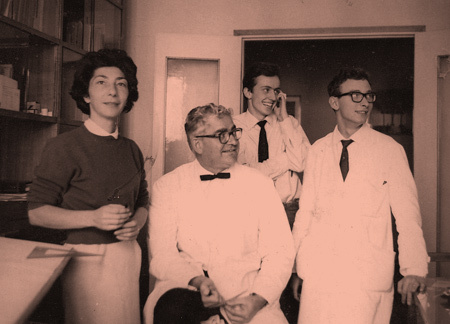 In Lausanne, among the students, he meets Vito Latis, Angelo Mangiarotti, Vico Magistretti, Alberto Rosselli and Silvano Zorzi. Transfer to the Zurich Polytechnic, where he is grouped with the Polish camp at Winterthur, and conducts research on thin vaults. Return to Rome, where on 3 October he marries Anna Gatta. Move to Milan, living in the house of Eng. Mario Tamburini; start of collaboration with the construction company of Eng. MARIO TAMBURINI based in Milan. Technical director of the company with responsibilities of design and work supervision, estimates and project accounting, as a freelance professional with a profit-sharing agreement. 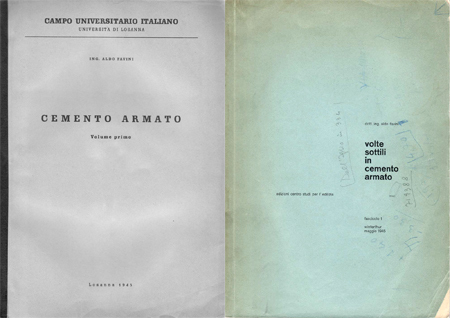 Publication of his first article in Italy: “Calcolo di una volta sottile a forma di conoide” (Calculation of a thin conoid vault), in the magazine “Il Cemento.” His publications of a scientific character continue in the “Giornale del Genio Civile” from 1949 to 1960, and then in the “Atti dei congressi internazionali dell’A.N.IC.A.P., Associazione Nazionale del Cemento Armato Precompresso” until 1970. Articles on his constructed projects are published by “Domus” and by technical engineering magazines. Following the suggestion of Gustavo Colonnetti, he goes to France with Silvano Zorzi to meet Eugène Freyssinet. He patents the jack and wedge of the anchoring system for cables in prestressed reinforced concrete (Sistema Favini). Start of independent professional practice at Via Crivelli 17 in Milan, continuing from 1964 in the studio at Viale Filippetti 28/a. 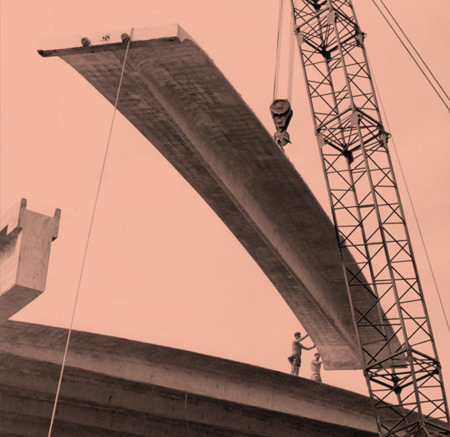 His activity focuses on the field of civil and industrial constructions with structures in prestressed reinforced concrete, in projects that are often of an experimental character, always documented by specific publications. Patent on metal equipment for temporary bracing of reinforced concrete slabs (AL.FA beam). Wins competition for bridges on the Milan-Cremona-Po navigable canal. Patented system for large parabolic roofing element in prestressed, precast reinforced concrete for industrial structures (Copponi AL.FA). For the mixed structure of the IBM training center of Novedrate (CO), he receives the international prize of the “Convention Européenne de la Construction Métallique” for Italy. Presentation of his work at the “Collegio degli Ingegneri e Architetti” in Milan, with a public conference. His work is studied for the first time in a degree thesis by Filippo Meda at the Department of Civil Architecture of the Milan Polytechnic. In Milan, at the Department of Civil Architecture, opening of the traveling exhibition of his work as an engineer-designer, Aldo Favini. 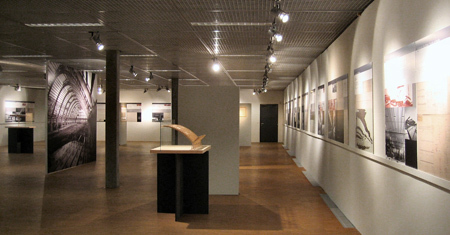 Architettura e ingegneria in opera, then shown in 2005 in Switzerland at the School of Architecture of Winterthur and at the Federal Polytechnic of Lausanne, with a last stop at the Aldo Rossi School of Architecture in Cesena, from 28 September to 29 October 2006. Approval of Fondazione Aldo Pio Favini e Anna Gatta. Donation of the Aldo Favini archives and library to the Historical Archives of the Milan Polytechnic. 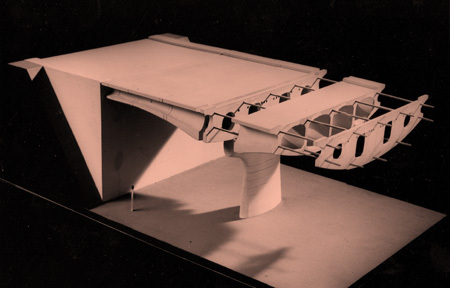 Favini’s bridge type is shown at the Milan Triennale in the section on Italian engineering of the exhibition L’Architettura del Mondo. Infrastrutture mobilità nuovi paesaggi. Death of Favini in Milan.